Former Taiwanese president Chen Shui-bian is to be released from prison after being granted one month of medical parole, officials say. Taiwan's justice ministry said it had granted Chen parole due to various ailments including brain degeneration. 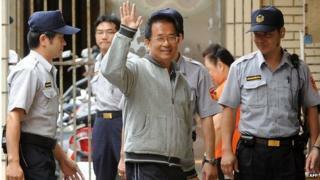 Chen, president from 2000-2008, was six years into a 20-year sentence for money laundering and accepting bribes. The justice ministry said it would decide whether to extend his parole at the end of each month. The BBC's Cindy Sui reports from Taipei that as president, Chen angered China by pushing for Taiwan's formal independence. He has accused the current government of political persecution in order to appease Beijing, as it pursues closer ties with China. Chen, a former lawyer, was put on trial shortly after stepping down from his second four-year term in 2008. He has been suffering from a series of medical conditions, including depression and Parkinson's disease, and has for some time been asking to be released on medical grounds. Authorities said that last year he attempted suicide. Chen's former vice-president, Annette Lu, has been on hunger strike in an effort to draw attention to his situation. She was admitted to hospital on New Year's Day suffering from symptoms related to her fast. Chen's expected release was delayed last week after a courier carrying documents relating to his case got stuck in traffic.